Clint Eastwood became the name that he is largely through two roles: Harry Callaghan (the no-nonsense cop who made his debut in 1971’s Dirty Harry) and The Man with No Name (the lone gunfighter who first appeared in 1964’s Fistful of Dollars). In that time, he became an archetype of U.S. cinema: simultaneously projecting and embodying an image of a macho man with whom audiences identify with: the loner determined to make things right, the man who goes about his business with just the right amount of viciousness, belligerence, and vengeance. The intrigue in those films that he both directed and starred in, such as Play Misty for Me, High Plains Drifter, The Eiger Sanction, and The Outlaw Josey Wales, largely stems from his sometimes ironic manipulation of his own image. The Gauntlet portrays a level of tension between what we came to expect from Eastwood and how he acts. 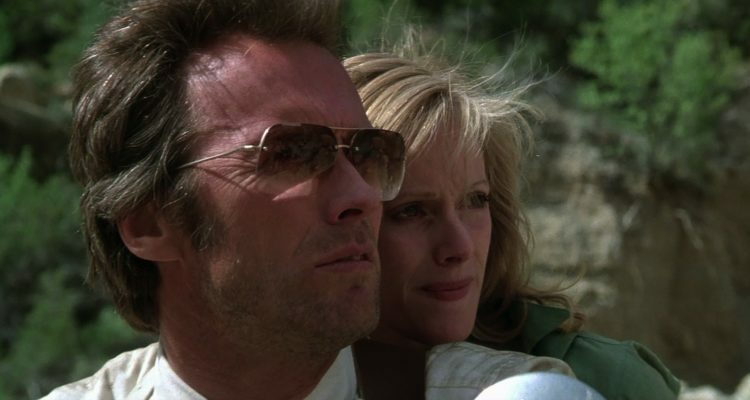 The Gauntlet is a comedic take on Eastwood’s macho image. The guns are pointed at him much of the time, and he is portrayed as sexually shy. He is embarrassed by dirty jokes and by the career choice (prostitution) made by the seemingly “nice girl” Mally. The film further reveals a discomfort felt by the actor for his body. The story itself, however, is classic Eastwood: funny, fast, and furious. It delivers an absurdist plot with a terrific amount of style and energy: the kind of movie which sees Eastwood right at home. He once again plays a cop, but not the hardened, veteran super cop of Dirty Harry: He’s a Phoenix detective and has no hero status to bear. While his track record in the department is hardly first-class, his police commissioner has a sneaky suspicion that he is the right man for the assignment at hand: Fly to Vegas, take custody of a prostitute and return her to Phoenix, so that she can testify in a key court case. He thinks it sounds like routine until after he’s taken the girl into custody and finds that the mafia has quoted 60-1 odds against her leaving the state of Nevada alive. Mally isn’t a stereotypical prostitute. She’s a pleasant, spunky, college graduate. She tells Shockley he should catch the next flight home, as there’s a contract taken out on her life. But Shockley isn’t easily persuaded. He’s accepted the job, and he’ll see it through until the bitter end. The journey sees the two strike up a co-supportive relationship (she will give up her night job if he gives up his Jack Daniels) though the film is focused more on the efforts of the local mafia to prevent them from reaching Phoenix. There’s a slightly tense moment when the return journey gets underway after surviving an auto bomb. Eastwood commandeers an ambulance, and they go on a high-speed car chase with three armed men. They hide in Mally’s place surrounded by a seemingly endless number of marksmen with badges who open fire and kill everyone in sight. That’s not, however, before they are forced to spend nights in the desert, confront Hells Angels, have a fight on a freight train in motion, and the finale, which sees Shockley hijack a bus before driving both him and his witness through Phoenix through a blizzard of machine-gun fire. Clint Eastwood was, for a long time, the kind of man that women wanted to be with and who men fantasised about being. His macho image may be more akin to Hollywood days gone by, but there will always be a place for such a character in cinema. Whether pointing a gun at his target before asking how lucky he thinks he is, or refusing to reveal his name while wearing a cowboy hat, iconic images and dialogue are never too far from Eastwood’s back catalogue. Eastwood’s characters were the kind you would think could do just about anything: Drink you under the table, outchase you, whether on foot or behind a steering wheel, or beat you at your favourite card game. Whether you enjoy a glass of whisky at your local bar or playing poker at an offline casino, you will likely, at least once, have pictured yourself as The Man with No Name. While you might attract unnecessary attention wearing a Stetson out in public, at least you could get away with it in the comfort of your own home, while playing online at a virtual or live casino game. Sites such as Casumo Casino offer free spins and a bonus to give you a head start, a definite advantage should Mr Eastwood himself ever feel compelled to should show up at your table. The screenplay was written by Dennis Shryack and Michael Butler. The script serves the mayhem in the same way that a musical on Broadway supports the songs. 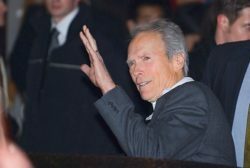 Eastwood’s talent is his self-assured and unhurried style. Locke is pretty, and even funny on occasion. In supporting roles, William Prince models some dapper haberdashery as the mafia’s contact within the Phoenix Police Department, while Pat Hingle has little to do as Eastwood’s nanny-like, fussy cop-friend. Eastwood shows, just like he did with The Outlaw Jose Wales, that he’s a skilled craftsman when it comes to directing action. He further demonstrates a talent for developing relationships; in spite of the number of violent scenes in the movie, there’s some enjoyable pacing, as the cop and prostitute make their way through a series of ordeals and begin to develop a fondness and respect for one another. As in most of Eastwood’s movies, the female lead has a good role. That’s an aspect of his movies that arguably gets lost in the midst of his macho image. But his female sidekicks, such as Tyne Daly in The Enforcer, have their own minds and are never given a role purely for decoration. 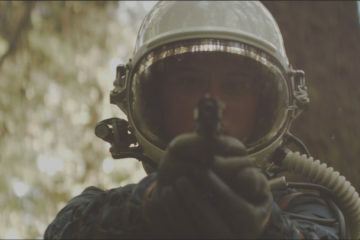 Eastwood himself has said that Locke’s role isn’t merely window dressing, but equal to – and perhaps even greater than – his own. As the advertisements for the movie put it, Eastwood is the “man in the middle.” And the film reflects his viewpoint. Locke’s Mally portrays a certain kind of cynicism which may be felt by Eastwood; but in doing that, she comes across as a foil to Eastwood’s Shockley: the movie’s true hero. The Gauntlet may have received criticism for its violence, but it’s of the pop-art, harmless, variety that often comes with an element of comedy. If popcorn-laced fun is what you’re looking for, it almost seems that an explanation of the movie wasn’t even really necessary. The movie is completely unrelated to reality and more to do with Clint Eastwood-style fiction, which is typically about a force that sets things right in a criminal society. Mission accomplished!